When I was growing up, I suffered from an inferiority complex where I always felt like I wasn’t good at anything. This stemmed from the fact that I grew up in an environment where academic results were a key indicator of your love and appreciation. I was told day in and day out that I was not smart and would never amount to anything, that the family convenience store would be my future because I wasn’t capable of greater accomplishment. When people tell you something so many times, at some point it will be like a fact or reality to you, because it was repeated so much and programmed in to your sub conscious mind. You start to behave and act the way that reinforces what was expected of you. During that time, everything seemed normal, but the daily struggle of coping and feeling worthless continued to dominate my daily life. I often questioned why I bothered going to school when my outcome was already confirmed. Why suffer and take those exams to then yield the same result? Looking back, I would say that I didn’t know better. I was not equipped to discern that I could influence the outcome. In my junior year in high school I turned things around and started believing in myself. My teacher encouraged me and gave me the nudged to prove that I could accomplish more. It is by no means that I figured out that I was smart, because I’m still not to this date. However I realized that I can do more than what I was programmed to believe in. Back then, I started a proving-myself list. It is similar to a do-not-do list in that I list the names of people who doubted me and aim to prove that I can get it done. Each time I prove to someone that I got the job done I will cross out that name. It took a while to see results, but I was patient and focused. It is my laser-sharp focus and consistent results that helped me get to where I am in my career. Over the last twelve months, I’ve focused on my do-not-do list. You might ask: what is a do-not-do list? A do-not-do list is a list of things that you’re currently doing or behaviors that you’re currently exhibiting that are holding you back. It is causing you to get stuck, thus failing to reach your full potential. By raising your awareness and proactively stopping those actions and behaviors, you’ll slowly move in the right direction and achieve your dream. So, what’s on my list? I’m sharing a piece of myself—this is tough one. The top two items are self-limiting belief and procrastination. What do I mean by self-limiting belief? My lack of confidence in myself often affects my ability to try new things and pursue new opportunities. When a new opportunity arises, I often talk myself out of trying or putting my name in. Not sure why, but since I’m aware of this behavior, I in turn challenge myself as to why. It is a difficult challenge to build up one’s confidence, but through baby steps and continuous progress it can be achieved, but it’s difficult to make the behavior go away. The second one is procrastination. Many times I will say to myself that I will do it tomorrow, even when I planned to do the task today. There is always tomorrow, isn’t there? Then tomorrow comes and I get really busy; I’ll do it again tomorrow. I’ve committed to blogging once a week. Since April, I’ve completed 22 weeks to date, an amazing accomplishment in my mind, but along the way, I almost missed making the weekly post twice. I’ve taught the do-not-do list to many people at work. To date, many of the folks who attended my class shared with me their perspective and progress. They said that it made them realized that they have something to work on and understand why they were stuck to begin with. Awareness it the gift of making this list; once you’re aware of it, you can decide to work on it. I’m proud to say that many of them are doing something about it. 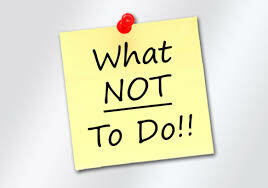 As you read this post, what would be on your do-not-do list? How will that list shape your future? I’d like to hear your perspective. Writing is a labor of love, if you like my post, share it with others. If you disagree, share me your perspective. Another very interesting and inspiring blog of yours. I encourage you to keep going!